For the first time in decades, a Sister from St. Scholastica Monastery is serving in the College's Campus Ministry office. Sister Lisa Maurer, who is also a volunteer Saints football assistant coach, is now working part-time on the team that seeks to cultivate personal and spiritual growth of students. She and Interim Director of Campus Ministry Jessica Ellingson are bringing new energy and methods of outreach. "Sister Lisa has been a wonderful addition to our staff," Ellingson said. "She's passionate about sharing the love of Jesus with our community. She genuinely seeks to build a stronger Catholic student community, and is eager to personally connect with students and support them during their time here." They have opened a prayer space called the Oratory in Somers Lounge. Masses are offered at 5:30 p.m. Tuesdays. "I feel prayerful in that lovely little space," Sister Lisa said. "Every week it seems to be a different group of kids in there." 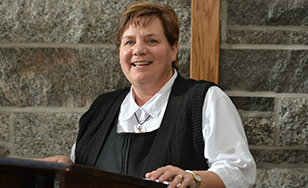 Campus Ministry serves students on all spiritual paths, with Sister Lisa focusing on Catholics. During October, the month of the rosary, she hosted gatherings to pray the rosary by the statue of Mary at the main entrance of Tower Hall. In November, she organized a Book of Remembrance in which students, staff and faculty could enter names of loved ones - both in person and remotely for students who are at extended sites or online. The book's pages were filled. Sister Lisa and others prayed for those listed. She works with student employees of Campus Ministry to empower them in their ministry among other students, and hosts social gatherings after Sunday Mass in Our Lady Queen of Peace Chapel. She counsels students who are interested in joining the Church. At lunchtime on Tuesdays, she walks around campus dining places to visit with students. "I just check in with them about how school's going, what things might be stressing them," she said. "They end up telling me about their classes, their families, their jobs, their plans. Getting to know them is important, so they're aware that Campus Ministry is here for them on their journey." In the current semester, Sister Lisa plans to begin a weekly program called Sundays on Wednesdays. She will gather with students to read and discuss the coming Sunday's Scripture readings - and to enjoy a sundae. In February, she will lead a confirmation retreat for Catholic youth in the city of Superior; a group of up to 20 St. Scholastica students will help her run the daylong event. All this while carrying on her other ministry, directing formation for women who are on their way to becoming Sisters in the Monastery. She also gives talks and leads workshops a couple of times a month. Her overarching goal with Campus Ministry is simple: "To let kids know that they're loved by God. That they are special, and important, that they have a family here, someone who cares about them... As a college, we want our students to have the best experience they can and their spirituality, their faith life, is part of that."